On our way home from the Atlanta antique show, we took the I-12 bypass around the North Shore of Lake Pontchartrain, bypassed New Orleans all together, and rejoined I-10 south of Baton Rouge just in time for the swearing in of Louisiana's first Indian governor since Reconstruction. Early during the Occupation that followed the War Between the States, blacks were franchised in Louisiana, and whites were demoralized. Thus, together -- so to speak -- they elected a black state government that included a black governor, Pinkney Benton Stewart Pinchback. black candidate is elected to office, the news reporters say, "Lumpty Dumpty is the first black to hold this office since Reconstruction." Jefferson Parish's late Sheriff Harry Lee (Chinese) gave birth to the joke, e.g., Harry Lee was the first Chinese elected sheriff since Reconstruction. (For Yankee readers, let me say that this was a good spirited joke.) And Bobby Jindal is the first Indian elected Governor of Louisiana since Reconstruction. Governor Jindal is expected by most to do a fine job. I, too, think him a fine man. He and his lovely wife, Supriya, are Christians, but descendants of the land of Hindu. The Hindu have a prayer that is one of the most beautiful poems ever composed: "I see The God in you." Govern well, Bobby, as if you see The God in us. When we left Atlanta, mid-morning, we drove under, over and passed Atlanta's Hartsfield-Jackson International Airport. The world's busiest airport, and the only part of Atlanta most Louisianans have ever seen. This is a mistake. Atlanta is great. Not at all as new- New York as we expected. We planned on stopping overnight in Mobile, visiting the fort on The Bay, and stopping again at Beauvoir, Jefferson Davis' home outside of Biloxi. But when we hit Mobile we could smell The Swamp, and drove on. Mississippi came up in no time, and then we crossed the Louisiana boarder and saw a sign saying: "New Orleans 90 miles." So close we thought. We drove on. Then we remembered we were not going to New Orleans this trip. From a television picture, next day, we watched the Chief Justice of the Supreme Court of Louisiana nearly swear in the wrong man as Secretary of Something. In time he corrected the name of the office being sworn upon. The ceremony started with the introduction of the Governor and "his lovely wife." They did not appear. Later they were re-announced and pomp-and-circumstanced down the steps Huey P. Long built. It should not be fair to criticize any one's renderings of the very difficult Star Spangled Banner. But, what the hell. What we got was a mix of something between Roseanne Barr and Little Richard singing Nina Simone. The band played something else. Inaugurations and such swearing-ins are usually not nearly as interesting as watching sugarcane grow. This one was. When the announcer introduced the Governor's Speech, "the governor" smiled, bowed and got through an inspiring portion of it before someone pointed out he was not yet the governor. The speech was halted. The new governor was sworn in, and the speech was resumed. I would not have missed this inauguration for all the snow in Atlanta. We drove to Opelousas to buy wine glasses and visit the M. Prudhomme Home, on Prudhomme Circle, built circa 1820. This is a third or fourth generation French Creole mansion that took my breath away when we drove up. The family is the one that gave New Orleans its internationally acclaimed chef Paul Prudhomme. And Opelousas is near the place where locals dress up for Mardi Gras in Medieval costumes and chase chickens from horse back. 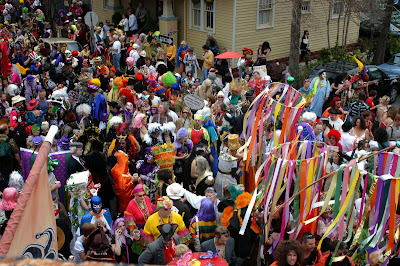 Mardi Gras falls very early this year. On February fifth. In New Orleans the day will pass more sedately than in Opelousas. In the rest of the nation it will simply be Super Tuesday.